mother. She had carved and painted the little hearts that are so full of message. Why, we ask, is the term "Christmas" so frightening for some? It's been a tough couple of years for "Christmas". Hijacked, reviled, given other meanings, subsumed into someone else's holiday...poor Christmas. 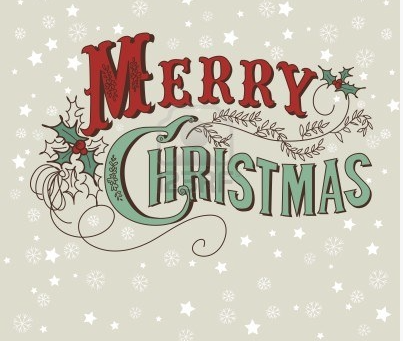 Christmas has never done anything but be itself. 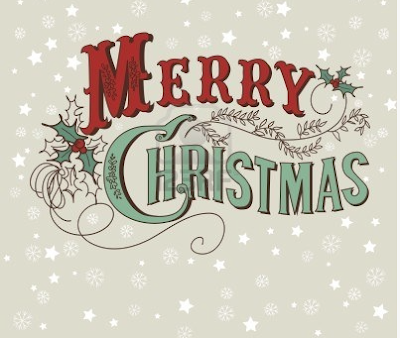 The term means Christ-Mass, a specifically Christian derivation. the term is less seen it shines even brighter! more about love than gifts. There was a spirituality about it all, the Christmases I knew. We can still find it today if we seek it in the right places, sort of like following the star. But, back then it surrounded and comforted us. My memories jostle for space - they live at the foot of years upon years of Christmas pasts. Joy was found in DIY (do-it-yourself) long before the term became vogue. Out in the woods on a sharp snowy winter day looking for the perfect greens, the best moss, holly and red berries. Small feet crunching on packed snow looking for the wherewithal to create a creche for the Holy Family. It tickles the top of my nose to remember the cold. Our baskets filled with gifts from the forest. As I went through old photographs not yet on my computer albums, I came across this one. Amazed, I realized it was taken in 1947 and included our Christmas tree and creche or it was my Aunt Eleanor's? Just above my head (I am the oldest at 7 years old,) is the creche filled with greens from the woods nearby. Greens we had picked. You can see the wise men figures approaching the crib. Note the levels, they were comprised of moss and rocks and perhaps boxes holding it all up. Next to that on the right is the Christmas tree strewn with old fashioned tinsel. 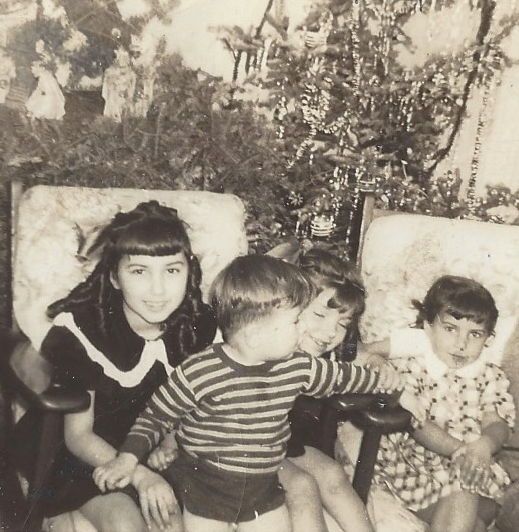 That is my little brother on my lap, my sister Kathy next to me. It was tradition that we girls wore velvet for Christmas day, and this was taken Dec, 25, 1947. To the right is my cousin Helena, my Aunt Eleanor's daughter. To this day I love wearing velvet around this holy day. 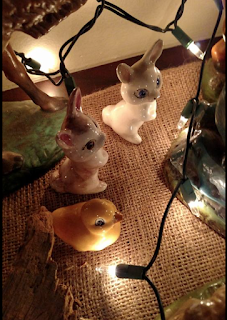 One of my sisters has my mother's handcrafted creche with all its ceramic figures she lovingly painted in a ceramics class. I recognize each little statue like an old friend feeling the curves and lines of the angel watching over it all. Year after year more tiny figures were added as my mother was given or came upon little squirrels, tiny fish, a mirror to act like it was a pond. Then she started carving her own little animals, too. Each year the Creche became higher, wider. Soon there were levels that pretended to be hills and sparkling dark blue cloth like the night sky. First, we as children were drawn into the Christmas story within that beloved scene, then grandchildren knew it each year as they grew. There were two stories. The great, grand story of a Savior's love for us, and the wonderful warm story of a mother and grandmother's love for us children. Added to that was another Creche created out of love and that was of our dear Aunt Eleanor. Her Christmas seasons were over too soon but not before her love had marked us and kindled in us the understanding of this season. more tiny creatures to grow the Nativity Scene. Did you know that St. Francis of Assisi created the very first Nativity Scene in 1223? He had been inspired by a trip to the Holy Land. His Scene was a live one. It started the whole world wide custom and continues to this day. Each culture made it their own with the landscape and people. For example, the Portuguese put a little pot of sprouting wheat seeds alongside the manger symbolizing the Bread of Life. In every Christian Church today, some form of Nativity scene is displayed, and in many homes as well. The Message continues. 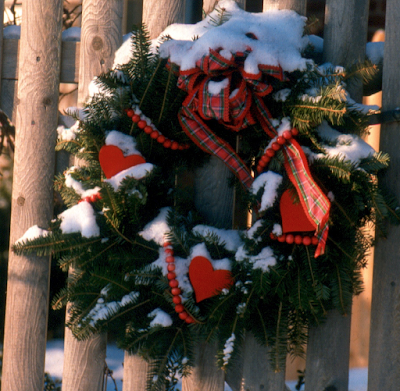 As a child, our Christmas times were filled with wonder and what seemed like a never-ending celebration. The stars in the Village winter nights promised bulging stockings (even if only with tangerines and hard candy) and presents below our tree (not many but each precious). By the by the Christmas stockings were our own and not works of art. The great Creche in our Village Church, St. Anthony's, could fit a small child as it did so long ago. The bright warm lights and soaring voices of our choir set our souls aglow. The Nativity set was so large whole pine trees guarded its boundaries, red poinsettias warming it along with the single light shining down on the manger where the child would lay. Part of all the magic was going down to see the Christmas display on the Green in the center of Taunton. As a 7 year old the lights and snow must have seemed incredible. Would that we keep our childhood sense of wonder. 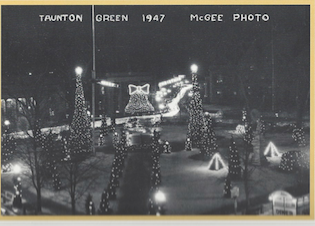 Below is a photo of the Taunton Green Christmas display in 1947, the same year as the photograph above with us children. years of the Christmas City displays. An interesting note from the book "Candles on the Green" is that the lights-on ceremony that year boasted light snow. On Christmas Eve the temperature was below zero. The day after Christmas, Rosalind Ballroom burned down! A few historical tidbits from my little city that keeps its Christmas displays going even to this day...and always containing a religious motif! The gift of Family was learned, too. Back then, the arms of many Aunts, their coats scented with the cold, were always seeking to hug and clasp close a small one. The laughter and energy of a gaggle of cousins high on Christmas candy and excitement sounded through our house. We feed on our memories, the good ones from my childhood Christmases color over in bright hues any sad ones. There was such a place as the Village in the 40's and 50's and we lived there. It takes longer to reach back now, I may forget a thing or two. But, they continue to be brought back to life. Our memories can still be a source of smiling and sharing. They still occasion a prayer for those no longer here. Today the digital world provides us with a way to share such memories. The great thing about this blog is that it will still be here long after I am gone. Still a remembrance of such a place - of faith, family and friends. But, not yet. Still going...this little engine of memories. Still being crafted and dusted off. and keep you and yours close. Candles on the Green: Charles Crowley and Dr. William Hanna. Available at the Bristol Country Historical Society as well as Amazon.com. Photographs from my Collection and that of my sister, Kathleen Campanirio. Photography collection of my mother, Angelina Souza.